TACLOBAN CITY-The Philippine Information Agency (PIA), regional office 8 was adjudged as this year’s “Best NSM Agency” in Eastern Visayas in recognition for its significant contribution through various information dissemination activities during the month-long celebration of the 29th National Statistics Month in the region. Venus May H. Sarmiento, officer-in-charge of PIA-Region 8, received the plaque of recognition during the awarding ceremony held at the Bangko Sentral ng Pilipinas, Tacloban City on October 30. 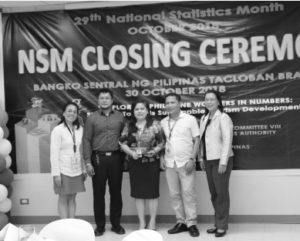 “We are so much honored for having been chosen as the first-ever Best NSM Agency in the region and our NSM-related activities were recognized by the Regional Statistics Committee,” Sarmiento said. 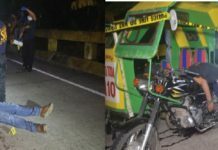 Sarmiento also said the major activity which PIA conducted, despite limited budget, was the regional essay writing contest participated in by the six provincial winners wherein the provincial contests were facilitated by the respective PIA Information Centers. Other activities which PIA-8 conducted include kapihans, guestings of PSA officials in PIA radio programs, social media blasting of the NSM activities and sharing of infobits, news and photo releases, hanging of NSM tarpaulins at the regional office and in all PIA provincial offices, poster making contest, and coverages of other NSM activities, Sarmiento added. 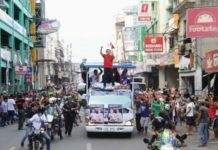 “We are also grateful for the support extended by our generous government and private partners, as well as our PIA Information Center Managers and staff whose contributions were instrumental in our efforts for wider information dissemination extended to grassroots communities,” Sarmiento further said. The RSC’s search for the Best NSM Agency 2018 aims to encourage wider participation to the NSM celebration and was designed to promote the conduct of activities to further promote the objectives and spirit of NSM celebration in the region.